Have you ever wondered why so many gay men wear leather? We did, simply because we are gay men like that. And we found out the question isn't easily answered but leads to very interesting stories and pictures. We first published our quest as a one-page story on the Internet in 1997. But our investigation didn't stop there. We found more books, articles and pictures, got into contact with other interested people and some of them even sent us books and very rare material that they had kept for decades! In the years since 1997 this led to several makeovers of our story. 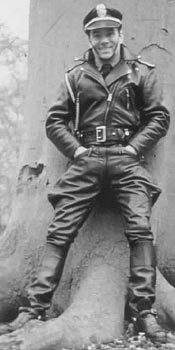 In this version we start with the general history of leather from a gay perspective, then a part about gay leather fetish and finally we publish unique personal stories of three very interesting gay leathermen!